Your WMFHA membership comes with FREE membership in the National Apartment Association (NAA)! NAA is a federation of 160 state and local affiliates, comprised of more than 73,000 multifamily housing companies representing more than 9 million apartment homes throughout the United States and Canada. NAA is America's leading advocate for quality rental housing. Their mission is to serve the interests of multifamily housing owners, managers, developers, and suppliers and maintain a high level of professionalism in the multifamily housing industry to better serve the rental housing needs of the public. NAA's purpose is to support an industry that offers safe, affordable multifamily housing to the public, equitably compensates its workforce and provides investors with a fair and reasonable rate of return. NAA provides a wealth of information through advocacy, research, technology, education, and strategic partnerships. Through a joint legislative alliance with the National Multifamily Housing Council, NAA protects and represents your legislative and regulatory interests at the federal level. NAA monitors legislation and regulations in all 50 states and shares that information with your local and state affiliate staff. 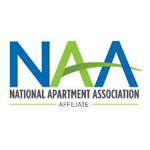 The NAA Education Institute and Washington Multi-Family Housing Association offer six nationally recognized credential programs and actively promote the apartment industry as a viable career choice. Together, we continually provide education and training opportunities for both managers and on-site staff. NAA publishes the monthly Units Magazine. In addition, NAA offers the industry's premier education conference and trade show, Apartmentalize, which attracts thousands of multifamily housing professionals each year.